Racism is a form of discrimination that occurs when a person or a group of people are treated less favourably because of their skin colour or their perceived membership of a particular ethnic, cultural or religious group. Any distinction, exclusion, restriction or preference based on race, colour, descent, or national or ethnic origin which has the purpose of effect of nullifying or impairing the recognition, enjoyment or exercise, on an equal footing, of human rights and fundamental freedoms in the political, economic, social, cultural or any other field of public life. Racism may be expressed by an individual, by a group of people or by institutional structures and processes. It may intentionally single out an individual or group for unfavourable treatment or it may unintentionally disadvantage them in a particular context. 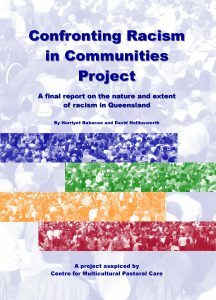 The Confronting Racism in Communities Report launched in 2005 explores the variety of racisms experienced by people from culturally and linguistically diverse (CALD) backgrounds in Queensland. The Report was the result of a three-year pilot project funded by the Queensland Government through Multicultural Affairs Queensland (MAQ) and managed by the Centre for Multicultural Pastoral Care (CMPC) in partnership with other multicultural, mainstream and government agencies.